The Pavillion Mall on Senapati Bapat Road has quicky blossomed into a hot-spot for fashion, food, and entertainment. We love their basement food court, rooftop events, and the variety of stores that aren’t present elsewhere in Pune. That being said, here are 5 new things we discovered recently at The Pavillion. Iconic houses over 80+ international fashion brands under its roof; like Aeropostale, Calvin Klein, GAP, U.S. Polo Assn., Elle, Tom Tailor, Antony Morato, etc. Launched at The Pavillion in April, their contemporary, up-to-date collections make it a great destination for the discerning fashion fanatic. You’ll find everything from clothing to footwear, accessories, watches, perfumes, and much more – all at Iconic! 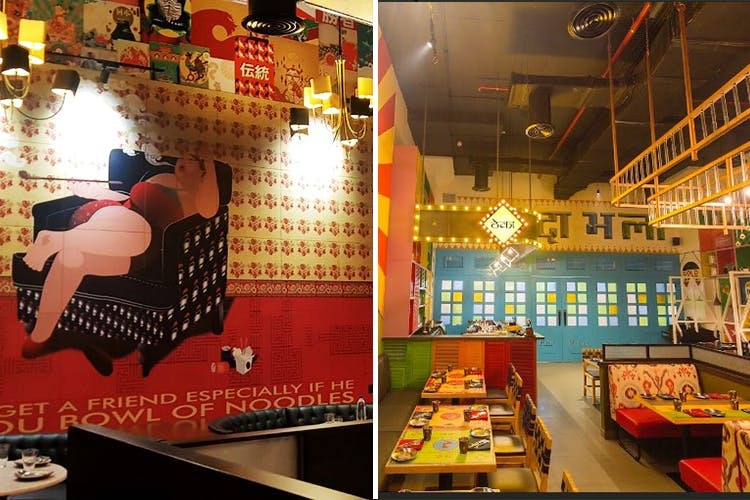 Delhi’s popular franchise, ‘Dhaba’ opened their doors at The Pavillion in April, this year – and we got the first look (more on that, here). Inspired by highway dhabas from around the country, their vibrant ambience and delicious food will keep you coming back for more. Whether you’re a home-sick North Indian, or just a foodie – try their tandoori bhune aloo, galouti kebab, chicken kolhapuri, and Rajasthani dhoongar lal maas with Dhaba’s mouthwatering egg biryani. Save room for dessert – we hear their badaam halwa and kesari phirni are quite the treat. Kiko Milano tout themselves as ‘Italy’s leading make-up brand’, having opened their first Pune store at The Pavillion in March. Kiko Milano brings professional make-up to their customers at an affordable price, and they offer a really wide selection of beauty products and cosmetics. From ‘matte liquid lipsticks’ to a ‘smart eye-shadow palette’, to their ‘pro power nail laquer’ – there are tons of options for you to keep your make-up game on point! Another popular franchise, Mamagoto also launched their first Pune eatery at The Pavillion in April. We love their casual-cool vibe, and fun, quirky decor. On the menu is contemporary pan-Asian fare, but don’t expect “authentic” food; what you can look forward to, is trying new and inventive dishes, with familiar flavours. We suggest trying their dim-sum, maki rolls, their ‘signature bowls’, and the sticky rice with mango, or home-made coconut and palm sugar ice cream for dessert. Read our full recommendation here. PURE Home + Living is a premium home decor brand, originally from Delhi. Here you’ll find everything from dining table sets, to cushions, vases, beautiful artificial flowers, candles, crockery, and so much more. We love their modern aesthetic – and think that even a few pieces from any of their themed (and colour co-ordinated) collections can really elevate your home decor. It’s fancy, but value-for-money quality stuff. Other recent additions to The Pavillion have been stores like Meena Bazaar, Orra, Jewel Crown and Zara. A handful of our favourite online brands have also set up shop here – like Zivame, Vajor, and Planet Superheroes.